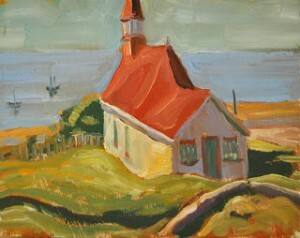 I spent a few days earlier in the summer on a tour through Quebec City and then on to Tadoussac. 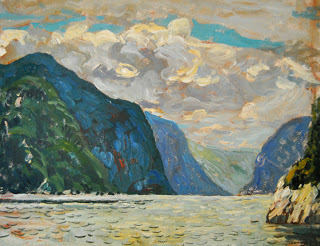 Tadoussac is the place where the Saguenay River joins the St. Lawrence River. 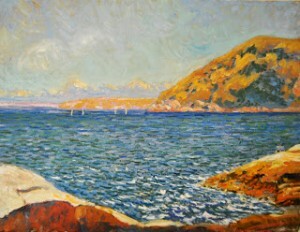 It is a paradise for a painter – every direction is a painting to be done. 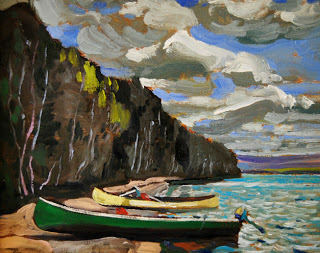 Deep blue water, rocky cliffs and big, big skies. The town itself has it’s charm – specifically the white clapboards and red roofs of the hotels and churches perched up above the cove. The surrounding bluish green hills, and sparkling water created many opportunities to work on landscapes full of light and atmosphere. 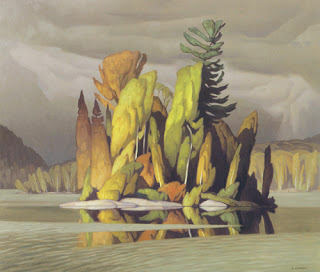 Of particular interest to me on this trip was the rendering of distance – far shoreline, distant mountains, clouds. With these paintings I hoped to work on the effects of light and colour seen across a distance. Using similar motifs but changing the tone I was able to practice these effects. Here are some of the results. I was talking with a friend last night about painting outside. His view was it was a challenging process that many would not want to tackle. 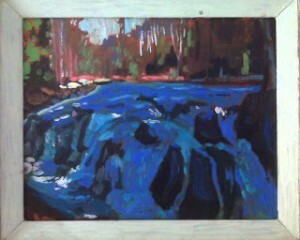 I have painted out of doors for years and I would recommend it to any artist. One of the ways to make it easier is to be as portable as possible – small paint box with paint already squeezed out. I don’t take tubes into the field. Small boards or canvas at the ready, a section of 2 or 3 brushes. I bring a couple of dry cloths to wipe brushes between colour. 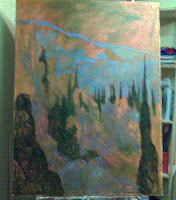 I don’t use any mediums so that minimizes things to carry – I have a really light easel and a small fold up stool. All of this fits into one shoulder bag. I can walk for miles with it. A few weeks ago I was painting a farm from the side of the road, the owner walked up and asked me if I wanted to come in and paint. He gave me a free run of the property and I have returned to spend some pleasant hours in his fields. My first paintings out of doors were as unsuccessful as my first paintings indoors – but keep at it, good things will happen if you stick with it. 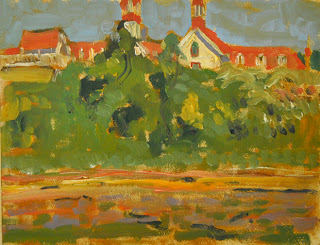 I had a request to paint a number of sketches of places up in the park earlier this month. I have been up there countless times and have a trip planned for the first week in May. I go up there every year for the opening of trout season to spend a few days fishing and painting. I usually head to the northern edge of the park in early May – there is often still snow on the ground. There are no leaves out yet and the fiddleheads are just poking through the leaf litter. This year we are going to Kiosk. I have been in there before and there is lots of good fishing to be done. We troll for lake trout in the big lakes using copper lines and William’s wobblers tipped with minnow heads. On the creeks we’re using light tackle and small spinners for brook trout. The painting is pretty good too. There are lots of creeks and little lakes that are close by, providing great views. If the weather cooperates, I paint in the morning and early afternoon and then gear up to fish for a few hours till dusk, hopefully catching something for the pan. Check out my next post in a couple of weeks for the results of the trip. 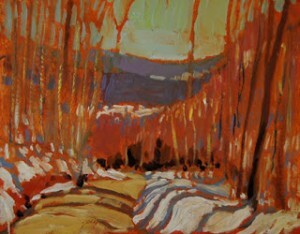 Painting plein air – spring comes to the mountain. 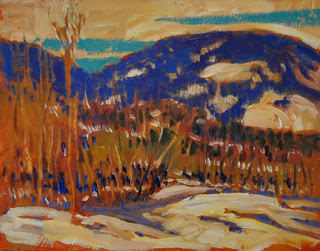 I was in Ellicotville NY last weekend and spent some time painting in the mountains. Armed with a stack of small panels I headed into the countryside from the inn that we were staying at. Every direction I looked wanted to be a sketch. The snow was leaving the woods revealing orange leaves, red mud and dark green streams of snow melt. The low mountains were purple and blue against a bright sky. 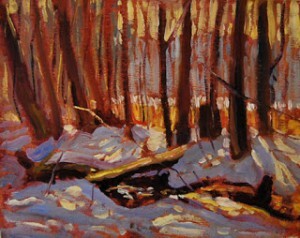 The mornings were cold but the afternoons warmed to above freezing and I was able to paint until the light left. 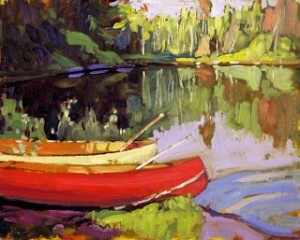 I find that a painting done outdoors has a quickness and freshness that is sometimes a challenge to find in the studio. 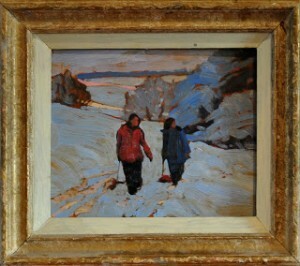 I was working small (6 x 5) – a great size to capture the moment quickly with not a lot of room for detail. 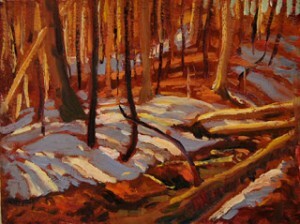 Following our return I had paint left on my pallete so I spent a morning at Heber Downs painting the last of the deep snow in the woods. But as so often it happens, it is snowing again. Perhaps we are not through with the snow. https://www.gartharmstrong.com/wp-content/uploads/2017/02/cropped-GarthLogo3.png 0 0 Garth Armstrong https://www.gartharmstrong.com/wp-content/uploads/2017/02/cropped-GarthLogo3.png Garth Armstrong2011-03-23 17:50:562013-04-17 10:56:12Painting plein air – spring comes to the mountain. Back after a busy time – It’s been a hectic 8 weeks. 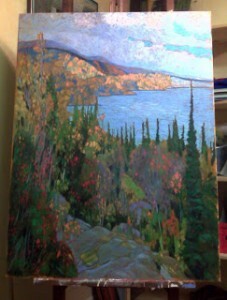 I have been absent getting ready for a book launch as well as completing a number of paintings for a big show at Artworld of Sherway. The event was a great success and the paintings looked great on the wall. I was really pleased how Donna, and the gallery team organized the show (and book) by seasons. 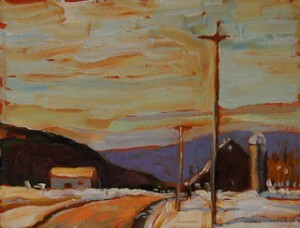 All of the work revolved around the theme, “Northward”. 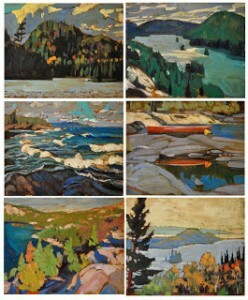 All images of Ontario, and Quebec, all rural or the wildness. 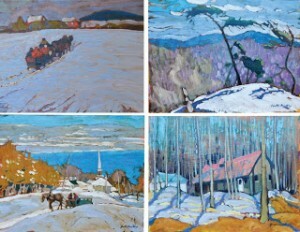 These are classic Canadian landscape motifs and I was happy to focus my attention there for a number of months in preparation. 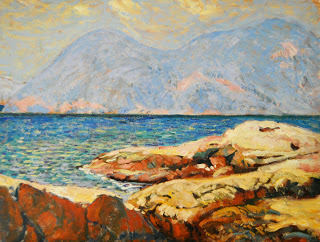 My hope is that I was able to produce work that was fresh, original, and at the same time familiar to all who live here. 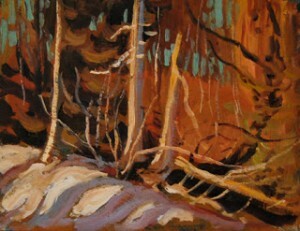 I completed about 20 sketches in preparation for the larger pieces – I was primarily gaining practice at painting trees in various light, specific snow effects, and sunlight on rocks and water. 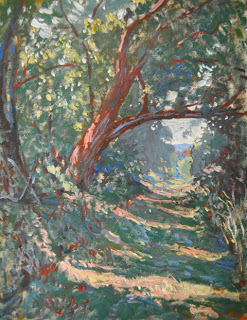 Of special interest during this series of paintings was the effect of bright sunlight. I have found that this can be a challenge. 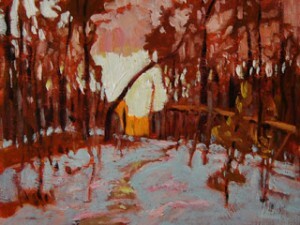 I wanted to do paintings that conveyed the feeling you get on sunny summer and fall days out of doors. This light can vary through a range from hazy to sharp and I really wanted to see if I could capture it. As the subject was the North, I also wanted to really to work with greens, using various tones to convey shadow and light. And, as with all of my work – keep it loose and spontaneous. The opening night was terrific and as always great to meet the people who purchase and enjoy the work that I do. It is really a pleasure to meet with you all and talk about art over a glass of wine. 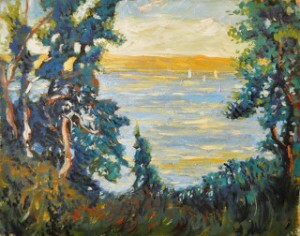 I am working right know on a number of views of the Toronto harbour using some of the ideas I developed in the Northward series. And I am off to New York this weekend to paint in the mountains for a couple of days – I will post them next week as a preview. https://www.gartharmstrong.com/wp-content/uploads/2017/02/cropped-GarthLogo3.png 0 0 Garth Armstrong https://www.gartharmstrong.com/wp-content/uploads/2017/02/cropped-GarthLogo3.png Garth Armstrong2011-03-11 17:52:102013-04-17 10:56:29Back after being north. The transience of light is sometimes captured. “Transience of light” – this is a great phrase and really was the goal of the impressionists: to capture the effect of true light in paint. Painting the quality of light in winter is my challenge for the next few months and I am jumping into my experiments with excitement. I use this term because all my work is experimental. Each picture is an infinite number of decisions and combinations never to be reformulated in the exact same way. 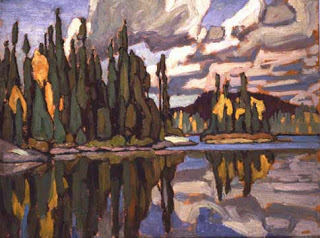 Composition may be copied – but tone, contrast and colour cannot be exactly duplicated. So each painting is a unique interpretation of an original idea. 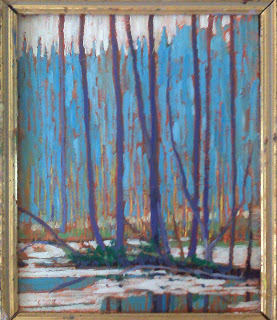 If somewhat successful, an impressionist style painting is a wonderful reflection of the transience of light that you can put on your wall. You and no one else possesses it. This, I think, is one of the great the allures of art. It is the allure for me as a painter, to make pictures, hopefully good ones, that have never been seen before, and can never be duplicated. Painting light and shadow on snow – there is no guidebook to follow. Snow can be purple, pink, green, blue, yellow, orange – it does not matter and I have seen it painted successfully in all of these colours. It can be subtle, or it can be stark – it can be painted warm or cool. The interpretations are limitless and so are the historical examples. I also have the benefit of photography – which also provides other clues and reference for the way light travels across the white surface. And I have the benefit of snow out my back door – I am looking at the sun weakly shinning through a silvery haze of fine snow. The ground is covered with a blanket of mauve and the trees in the distance the palest purple blue. 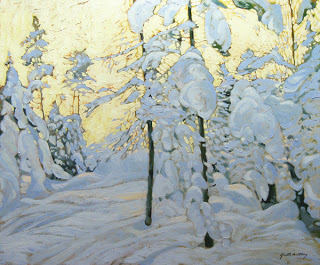 The snow is falling – it’s a great day to paint! https://www.gartharmstrong.com/wp-content/uploads/2017/02/cropped-GarthLogo3.png 0 0 Garth Armstrong https://www.gartharmstrong.com/wp-content/uploads/2017/02/cropped-GarthLogo3.png Garth Armstrong2010-12-09 17:53:482013-04-17 10:56:45The transience of light is sometimes captured. It snowed yesterday – and that’s good news. A strange thing happens to us after the first snow – even if that’s on Oct.30 – fall is over, winter begins. 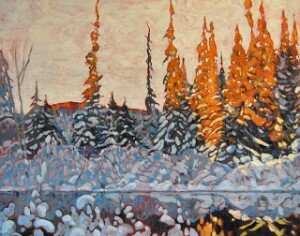 For me the requests for winter paintings start on the same day. 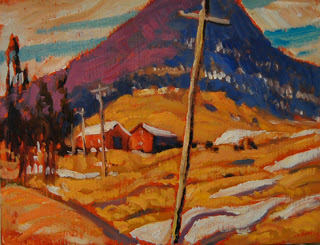 Not that I don’t like fall, but I have had a long a couple of months painting fall pictures and it’s time for a change. 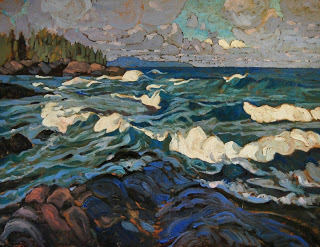 I wanted to show one painting in particular – a picture of a windy fall day on Lake Superior. I tried to capture the scudding clouds and the bold white caps and deep blue water that you always see on these types of days. There is just a hint of orange in the cedar trees along the shore. 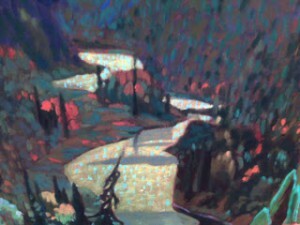 All of my fall canvases were the result of many sketches and here is a small portion of them. 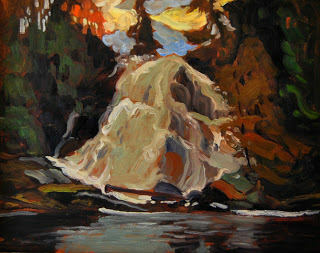 The subject matter comes from various travels – Kawarthas, Superior, Killarney. 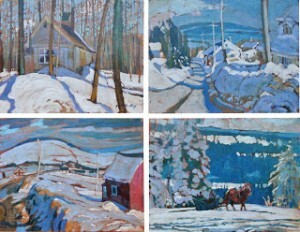 And so, winter is now on the go… here are the first 2 paintings. Both are interesting in that they are of winter but the pallet is intentionally all very warm – pinks, purples, reds, and oranges. 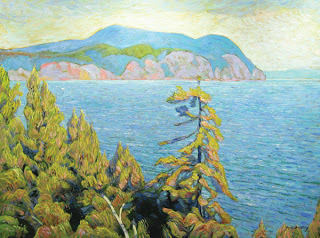 It is the management of the colour and of course the subject that provides the “cool” in these paintings. https://www.gartharmstrong.com/wp-content/uploads/2017/02/cropped-GarthLogo3.png 0 0 Garth Armstrong https://www.gartharmstrong.com/wp-content/uploads/2017/02/cropped-GarthLogo3.png Garth Armstrong2010-11-02 17:54:492013-04-17 10:57:13It snowed yesterday - and that's good news. I was working on a painting and started to notice that my eye always seemed to go to a focal point I had not really anticipated at the outset. It was a small island in a long skinny lake. The more I looked at it the more I liked the image. 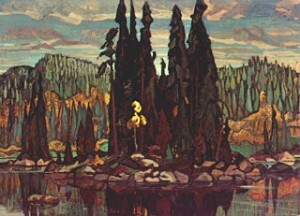 It reminded me of a number of group of seven paintings. Islands, particularly small deserted islands up north intrigue people. And when scouting for images to paint – intriguing is good. I wanted to do an island painting. Last week I was on Chemong lake for a couple of hours, fishing. The day was bright with a lot of heavy cloud scudding through the sky. A typical fall day when the sun can be shining in one spot and 50 yards away everything is deep in shadow. As I fished I watched a small island near the north end of the lake and every once and a while I took a snap of it – I really liked when the Island was in shadow and the sky behind was bright and full of moving clouds – that would be my island painting. I wanted to do something different so I cropped my island painting into a square and made it fill the picture – I did do something very typical of the group’s work – I flattened the picture out – keeping the background as intense as the foreground. I really wanted to create high contrast – almost a sillohette. 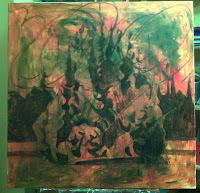 Here’s the picture in stages on the easel. A few thoughts about painting fall… As the summer closes and the leaves change, the quality of light is also changing. It is a really interesting time to paint. This season requires a change in approach. I have never been a big fan of pictures of fall leaves – canvases filled with reds, oranges, yellows. Over time I have begun to understand that painting fall is more about blue. That may seem odd but one of the keys to painting good pictures is contrast and that one way to achieve this is through the use of contrasting colours. So the contrast of all the warm colours of fall is the blues. 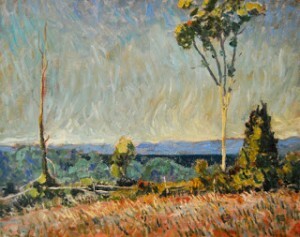 A lot of blue and a little bit of orange – makes the orange glow – just look at some of the impressionists paintings of oranges – they are often placed on big blue backgrounds. And the proportions need to be well thought out as well. Equal amounts of contrasting colour makes for a very unexciting outcome. 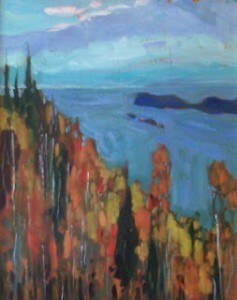 So in my newest series of fall sketches I am using touches of orange and reds but lots of blues. 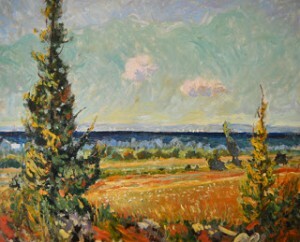 You can judge the success of painting fall, with blue. https://www.gartharmstrong.com/wp-content/uploads/2017/02/cropped-GarthLogo3.png 0 0 Garth Armstrong https://www.gartharmstrong.com/wp-content/uploads/2017/02/cropped-GarthLogo3.png Garth Armstrong2010-09-22 17:57:142013-04-17 10:58:04Blue about fall? I have been working through some sketches lately to arrive at 5 or 6 pictures that I can work up into large canvases. The first 2 have been on my easel for the last couple of days. I have taken some photos to show a bit of the process of how I work them up. 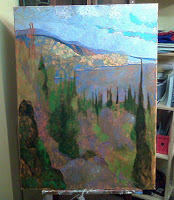 Here is the under painted 30 x 40 canvas. I prefer to work with wet on wet. The colours are applied on a wet warm coloured ground. 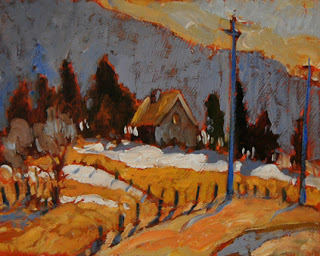 As a fall scene, little chips of this ground that show through should add to the overall warmth. 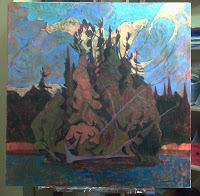 Here I am building the mid tones and the shadows. There will be a lot of green in the darkened foreground – in the underpainting I am working in purples to make the green more luminous when they are overpainted. The colour is built up evenly across the whole canvas – balance is important so I am not focusing on one specific area – just working evenly across the whole picture. 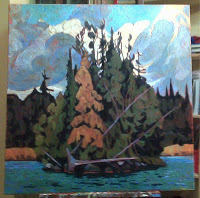 And getting close to the final picture – a few more touches and it will be completed. One of the most interesting places I have canoed is Killarney Park – the white stone there is really striking – it takes on the colour of the surrounding light. That’s the thinking behind this image – the sketch is high contrast – bright sky with almost sillohetted pines and rock. But the rock (being almost) white also takes on the colour of the sky. The under painting begins for the 40 X 30 version – composition is important with a simple bold images like this so if I get it right in the sketch, I want to maintain it for the larger canvas – a grid is used to scale up the sketch to ensure the balance is similar. 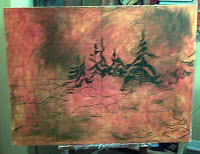 I have added in a few more trees at the larger size – to providing more visual interest. 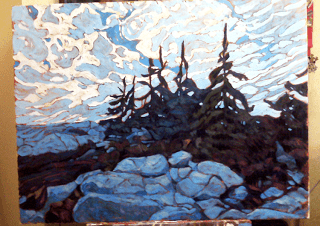 Here is the final painting – the white rocks are reflecting the blue of the sky – the pines almost seem to be surrounded by water – but they are at the top of Silver Peak – the highest mountain in Killarney.